A good clamp pad is something you depend on every time you move a barrel, roll, flat box, pallet – basically anything and everything you store in your warehouse. If your clamp pads are worn out, you risk damaging those materials and can put production behind schedule waiting for a new pair. Save yourself the hassle, and money, by replacing those worn pads with Sioux Rubber’s Clamp Pads. Our replacement pads reduce material damage, lost productivity and cost less than a brand new set. Sioux Rubber & Urethane’s Clamp Pads and forklift fork covers feature Endurawear rubber that’s vulcanized to the steel to create an unbreakable bond that can only be broken under extreme heat or hand-chiseled off. Our process creates a strong, durable finished product that will last for years. Rubber clamp pads decrease the damaging effect of metal that comes into contact with material that is being transported and extend the life of your forks, while protecting the product. It will give your forks the grab and rubber “feel” that can make the difference in your material handling needs. Sioux Rubber & Urethane can design a clamp pad or rubber fork covers or we can recover your current clamp pad. Our experienced staff has been recovering clamp pads for more than 30 years using some of the highest-quality rubber compounds available. With our quick turn-around time and high-quality Endurawear Rubber, Sioux Rubber & Urethane is your best and most affordable option. Worn clamp pads cause lost productivity due to downtime while you wait for a new set to arrive. Get back to work faster by allowing Sioux Rubber & Urethane to replace the old rubber covering on your current pads. This procedure is a cost-effective option compared to the cost of a new set of clamp pads. 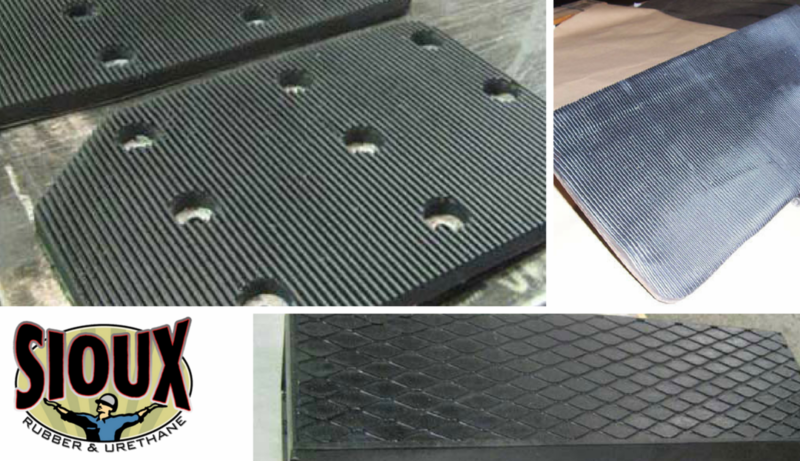 Sioux Rubber & Urethane offers a quick turnaround on recovering your current clamp pads. We use a high-quality rubber and several texture options. Plus, you’ll know it fits because we use the original mounting holes, making pre-drilling unnecessary. Don’t wait to get back to work. Download our Clamp Pad brochure and contact us today to see how big of a cost savings our Clamp Pads can offer your business.